Noun Project is teaming up with SVA to host an Iconathon to create a new set of public domain icons that represent women in design and creativity. Many visual representations of women are still outdated. Currently, if you search the web for images of “entrepreneur” or “boss” the majority of the results are images of men. Similarly, if you search for “caregiver,” “baby,” or “childcare” the majority of results are images of women. In this hands-on design workshop, we'll be working together to overthrow old stereotypes and create new icons that more accurately represent the women of today. The event will kick off with a presentation from Liz Danzico, Creative Director at NPR and Chair and Co-Founder of SVA's MFA in Interaction Design program. Noun Project Design Director Geremy Mumenthaler will talk participants through semiotics, symbolism, and best practices for icon design, and we'll break into groups to sketch and design new icons together. Each participant group will include designers and subject matter experts, so everyone will be able to contribute. At the end of the workshop, we'll all review and vote for the final set of icons that will be vectorized and placed into the public domain, free for anyone to use. No design or art skills are necessary, all are welcome to participate. Lunch and beverages will be provided. Visual language has the power to shape, reinforce and change our perceptions about the world. Many visual representations of women are still outdated. If you search the web for images of “entrepreneur” or “boss,” the majority of results are images of men. 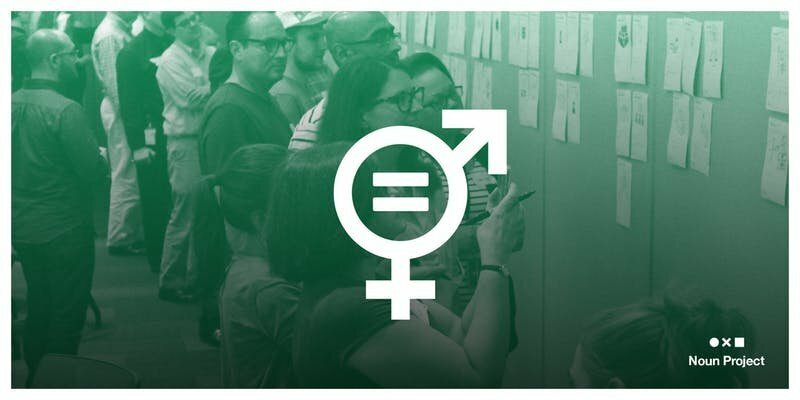 As the leader in visual communication, Noun Project will be championing equal representation of women by hosting Iconathon design workshops to create new iconography that accurately reflects women of today. The Iconathon series will be hosted in San Francisco, Los Angeles and New York. At the end of the series, the entire icon collection will be released as a public domain set. Visit the Noun Project blog for more information about this initiative. Lingo is reinventing the folder for today's visual world. Use Lingo's flexible canvas to build and share living style guides, image libraries and design systems with your entire team. It's the perfect tool to help designers and marketers ensure brand consistency at scale. Built by the team at Noun Project. Try it free at lingoapp.com. School of Visual Arts has been a leader in the education of artists, designers and creative professionals for nearly seven decades. With a faculty of distinguished working professionals, dynamic curriculum and an emphasis on critical thinking, SVA is a catalyst for innovation and social responsibility. Comprised of more than 6,000 students at its Manhattan campus and nearly 37,000 alumni in 75 countries, SVA also represents one of the most influential artistic communities in the world. Designers + Geeks is a community for people interested in design, art, and technology. We host monthly events that feature great speakers on interesting topics. Our community is open to everyone and our events currently take place in San Francisco, New York, Boston and Los Angeles. Subscribe to the Designers + Geeks newsletter to stay up to date on future events. Kindred Collective is an exclusive network dedicated to bringing together women in leadership positions to build a better and stronger society.